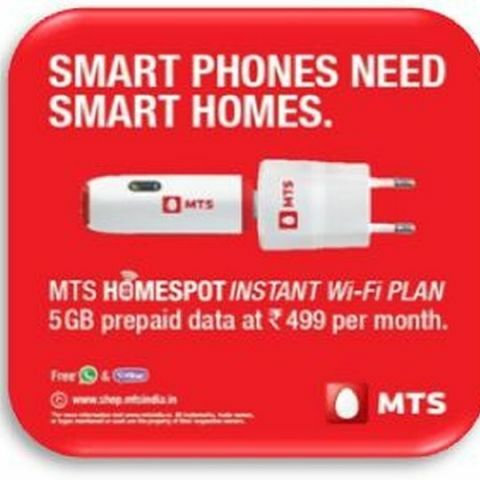 MTS is targeting the home segment; especially in the tier 2 and tier 3 cities with its new Homespot Instant Wi-Fi solution. Sistema Shyam TeleServices Limited (SSTL) that provides telecom services under the brand MTS today announced its entry into home WiFi segment with the launch of Homespot Instant WiFi solution. The Homespot Instant WiFi solution comes with an MBlaze Ultra dongle which works with a simple plug and play mechanism and can provide broadband access to five users simultaneously including smartphone users. The data plans for Homespot Instant Wi-Fi solution start at Rs. 248/- for 1GB of prepaid data with free WhatsApp and Viber. Customers can choose from a range of other unlimited prepaid and postpaid plans depending on their usage. MTS says its new solution marks a strategic shift in focus from being primarily a dongle driven data company to a WiFi solutions provider. Device Price – Rs. 1299 with 10 GB bundled data usage.